← Can a Family Member with Autism Live Independently? Family caregivers do a lot to ensure their aging loved one is healthy and safe, especially when they are less mobile then they once were. Some of the most devastating injuries that seniors can have come from slip and fall accidents. These are especially common in the winter months, when walkways and stairs are slippery with ice and snow. To help elderly adults avoid the problems associated with a slip and fall accident, family caregivers can take preventative measures to reduce the risk. Why Are Slip and Fall Injuries So Common in Winter? 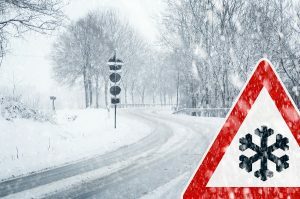 Winter weather brings ice, snow, wind, and sleet, which affects paths, sidewalks, stairs, driveways, parking lots and more. Indoors, people track in bits of slush and snow where it melts onto the floor, causing slippery spots that can send even the healthiest senior tumbling. People often wear heavier shoes and restrictive clothing, making it more difficult to maneuver as well. Thousands of elderly Americans end up in the emergency room each winter due to injuries from weather-related slip and fall accidents. Why Are Seniors at Risk for Slip and Fall Accidents? When elderly adults struggle with mobility issues already, and perhaps use a walker or cane to get around, unsafe walking surfaces become even more of a challenge to navigate. It’s common for them to have balance issues and weaker muscle tone, making them more unstable on their feet. They often have a difficult time living independently, and depend on family caregivers, senior care providers, and friends to help with basic tasks like dressing, grooming, meal preparation, and transporting them around. All of these factors put them at high risk for slip and fall accidents and winter conditions only add to that. How Can Family Caregivers Reduce the Risk of Winter Slip and Fall Accidents? Help them put on sturdy shoes with soles that are non-skid and slip-resistant. Place new rubberized tips on their walker or cane. Use floor mats near entrances to stop slush and moisture from being tracked into the house. Wipe up any moisture on the floor as soon as possible. Properly shovel and salt sidewalks and driveways at the home. Don’t let the elderly adult go out alone without support from family or senior care providers. Accompany the aging adult from the car through snowy parking lots. Choose the safest and clearest routes to walk when necessary. Stay indoors in hazardous weather. A little preparation by a family caregiver means that their elderly relative won’t have to suffer an injury from a slip and fall accident. If you or an aging loved-one are considering professional senior care in Clarksville, MD, please call the caring staff at Global Hands Inc. Call today 240-264-0769. This entry was posted in Senior Care in Clarksville MD, Senior Safety and tagged senior care in clarksville md. Bookmark the permalink.